Fear exists in all different forms. You’ve experienced it, haven’t you? Those times when it creeps up on you slowly and folds itself slowly over you like a blanket. Suddenly your lip begins to quiver and your hands begin to tremble. Maybe you’ve experienced fear and no physical reaction was visible outwardly, but inwardly your mind was racing and your emotions grew overbearing. Some months back, I wrote a prayer to conquer fear. And yes, the goal is to conquer fear in totality, believing God will protect and care for his own. But sometimes fear is just on the verge and I can feel it lurking. In those moments, I want to calm it before it even has the chance to raise its ugly head, before the battle really begins. Today’s reading in Zephaniah 3:16-20 for the #nofear Bible reading challenge sparked me to remember we don’t have to wait until the storm is blowing to call out to our God and conquer fear. He can calm our hearts before the storm ever begins to blow. I’m so thankful for that!! 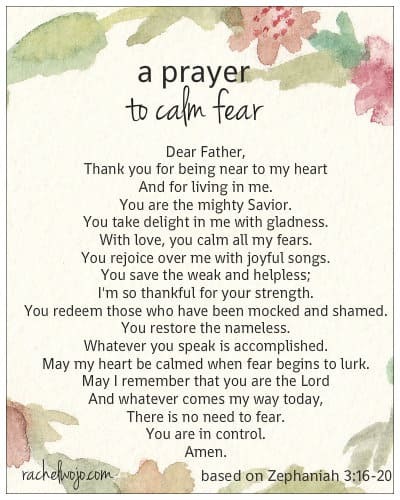 Enjoy this prayer to calm fear and make it your own. And for living in me. You are the mighty Savior. You take delight in me with gladness. With love, you calm all my fears. You rejoice over me with joyful songs. I’m so thankful for your strength. You redeem those who have been mocked and shamed. Whatever you speak is accomplished. 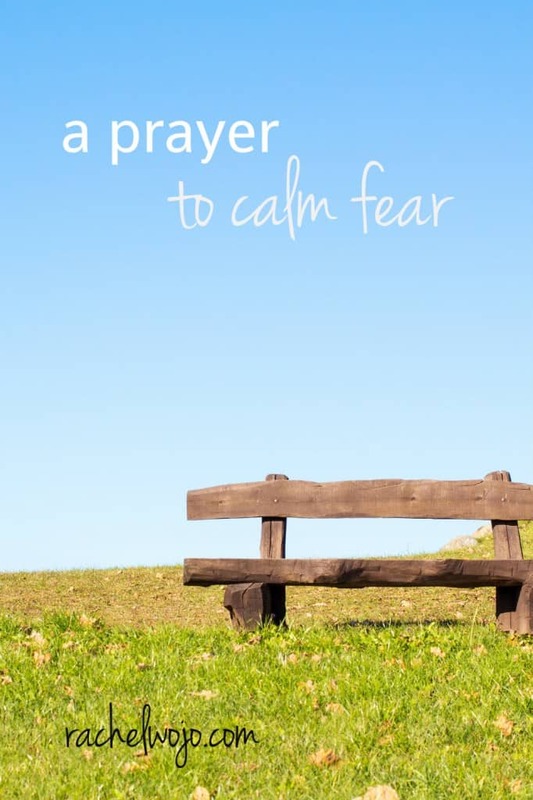 May my heart be calmed when fear begins to lurk. Thanks for this prayer. I pinned it to refer to often. I am anxious and afraid a lot, because I’m a worrier, so this will be great for me to pray in the mornings.